Establishing a pasture is a key step in having a thick, lush, profitable stand. A Perfect Pasture begins with good soil preparation. The first step is to obtain an accurate soil sample and im- prove soil conditions accordingly. Check with your local extension service for assistance. When renovating an existing pasture, use a non-selective herbicide to reduce competition. Selecting the right seed mixture is extremely important! Depending on your geographical region and application (grazing or hay, dairy cows or horses) you'll need to choose the mix that is right for you. Each Pasture Perfect mix is formulated specifically for its region AND application so you can be assured you're getting the best and most productive seed product. A properly prepared seedbed is the next step in getting that pasture up and producing! Pasture seed requires a fine, firm seedbed for optimum establishment. Large clods and excess sod will diminish results. A no-till method of seeding can be successfully used as well. Its best to spray out all vegetation to provide best results. A delay between spraying and drilling will aid in moisture retention and reduce pest populations. Contact your extension agent for specific chemical and management recommendations. Avoid planting seeds too deep or too far apart. Ideal depth for most seedlings is 1/8 - 1/4". (Do not plant seeds deeper than 1/2".) Adequate seed-to-soil contact can be ensured by rolling/packing soil. If you are no-till seeding into an existing pasture or for a new pasture, the proper seeding depth is 1/4-3/8" deep. All seeds need good moisture to get well established. Irrigate if necessary and plant during the fall or spring seasons. Additionally, frost seeding can be accomplished by broad- casting seed during winter months when the soil is freezing at night and thawing during the day. Allow plants to get well established before heavy grazing or set stocking. Once plants reach 8-12", mow or lightly graze down to no less than 3" in height. Allow plants to re-grow to 18"-20" before grazing again. This encourages the grass plant to tiller and also assists legume establishment by allowing more light into the base. (tillering of some species has shown to help in drought conditions) Continue rotational grazing to ensure that productivity/profitability of your pasture remains at a high level. Some species, such as orchardgrass, don't reach their full potential until the second season. Be careful not to overgraze, especially the first year. New pastures will benefit from early application of nitrogen applied 3-4 weeks after planting. Successive applications of fertilizer will prolong the life and improve the performance of a new pasture. Contact your local extension agent or fertilizer representative for specific recommendations. A high yielding grass mix that provides high quality, palatable, and persistent pastures all season long for cattle, sheep and horses. Each variety in Multi-Purpose Mix performs well for multiple harvest schemes including green-chop, haylege, and grazing. Multi-Purpose Mix is endophyte-free. An excellent mix for dairy, beef, or sheep producers. This mix is made up of 90% grass and 10% legumes, which will add pounds of milk, meat or wool to the farm production. The varieties selected for this mix work well in multiple harvest schemes including; hay, green-chop, haylege, and grazing. This mix also works well in heavier soils. Multi-purpose Plus Mix is endophyte-free. This mixture was designed for renovating pastures or hay fields. The mix adds very palatable and high quality grasses into the pasture with quick return. Many farmers and horse owners have grazed as early as six weeks after sowing Renovator Special. The grasses that make up this mix are easily established and can be frost-seeded, no-tilled, or overseeded into established fields. Dairy, beef, and sheep producers, along with horse owners can all benefit from using Renovator Special. It performs well for multiple harvest schemes including green-chop, haylege, and grazing. Renovator Special is endophyte-free. This mixture provides the horse owner with endophyte-free pastures all season long. 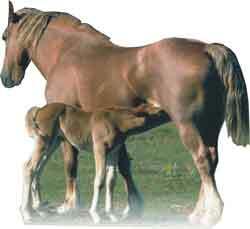 Each variety in Show Horse was selected to handle the close grazing habit of horses. Show Horse performs well for making hay or grazing. This mix works well in all areas where cool-season forages can be grown. Show Horse is a "horse-friendly" mix. Click here to find a Pasture Perfect® authorized dealer. Do you Like Farming but wish it was More Profitable? Cows on the Ardin Landis farm in MA (click on photo to enlarge). Click here to view trial data.